At Inspiremurals we’ve recently completed an amazing mural of Jesus at the Gardens of Gethsemane. 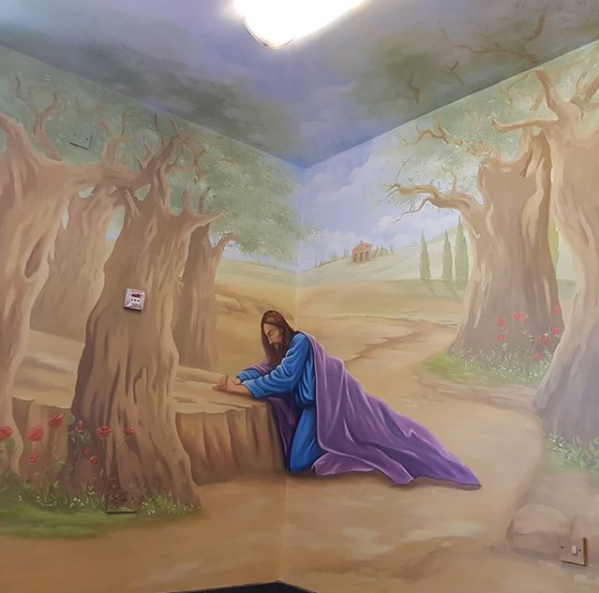 We were recently commissioned by our local Church of England School to bring one of their walls to life with a mural of Jesus at the Gardens of Gethsemane. We’ve been painting murals for many clients, we’ve worked for many high profile and celebrity clients such as Gary Barlow, Peter Andre, Elle Macpherson, Jacqueline Gold and a large number of footballers amongst others. If you’d like to discuss bringing your childs nursery, bedroom or playroom to life with one of our bespoke murals or indeed on of our amazing room sets then please contact us at sales@inspiremurals.co.uk or on 07766 316 326 where we’d only be too happy to discuss your ideas.